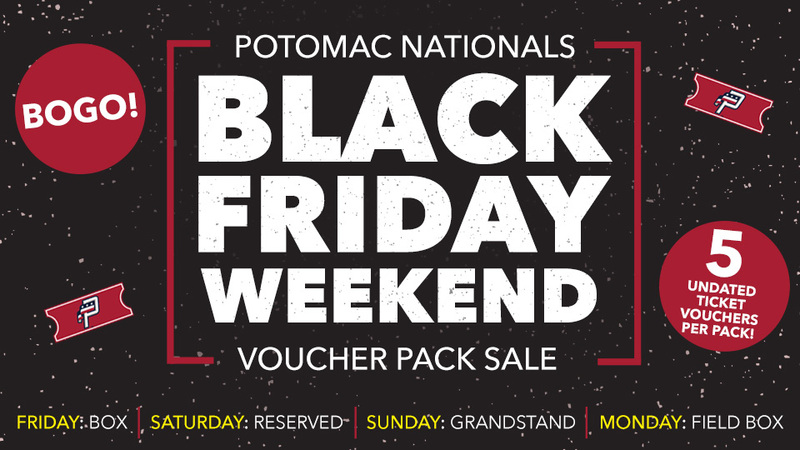 Woodbridge, VA---As the biggest shopping event of the season rapidly approaches, the Potomac Nationals are excited to announce a Black Friday Weekend ticket sale. This sale kicks off the availability of the traditional "voucher pack," and allows fans to buy one pack and get one for free! This deal will be available starting on Friday and will run through Monday. Each day during Black Friday Weekend, a different section of the ballpark will be available as part of the buy one, get one, opportunity. Friday, fans get Buy One, Get One (BOGO) for Box seats. Saturday, Reserved section voucher packs will be BOGO. On Sunday, BOGO on Grandstand seats. Close out Black Friday Weekend with a BOGO on voucher packs for the Field Box section.